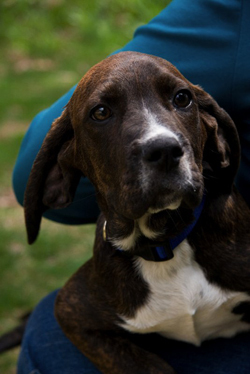 Bailey is one of 4 male pups who came up to us from a rural part of WV. They have never been in a shelter as the humane society who rescued them use foster homes. They are healthy and playful and ready for their new homes. If you are a family, please have a physical fence. If you are a working person, please have flexible hours and/or a dog walker. They are all crate trained and 99% house trained as they are used to going outside for potty. They all are very friendly and affectionate and all still have puppy breath. They love the water! 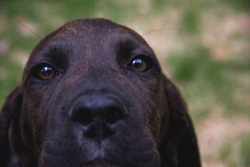 Bitsy Girl is a Redbone Coonhound mix who was abandoned, probably because she had come into heat. She looks to have had at least one litter, maybe more. She is about 2 years old and weighs about 40 lbs. Bitsy is a gentle girl, good with other dogs, and loves getting close for that attention! She's just been spayed and is current on vaccinations. This sweetie pie would be a wonderful all-round family companion! 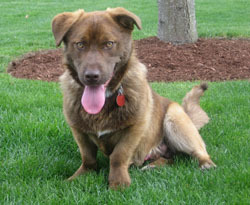 Brownie is a male neutered nine or ten month old Aussie/Corgi mix. He was dumped at a humane society along with his sibling, Linda. He is a sweet dog who gets along great with dogs and people. They have been living with a 17 month old child and a cat and other dogs. The dogs all eat from the same big bowl so no food problems noted. He is a SWIMMER, loves to lie in the doggy pool. We can't believe he's not adopted yet. He is the best dog. Loves everyone, easy keeper, great dog. 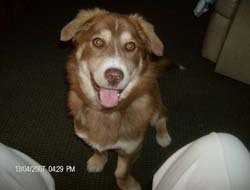 Junior is a nine month old male Aussie/Basset cross who appears to have some husky in him. We'll know more when he arrives on 4/30. He will be available to be seen after 5/2. He arrived with Linda and Brownie so is possibly a sibling. All three get along great together and are very friendly. 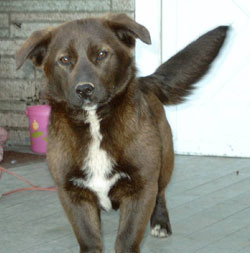 Linda is a female spayed nine or ten month old Aussie/Corgie mix. She was dumped at a humane society along with her sibling, Brownie. They have been living with a 17 month old child and a cat and other dogs. The dogs all eat from the same big bowl so no food problems noted. She is a sweetie pie of a dog. She LOVES the water. Will lie right down in the pool. She prefers people and is a real cuddle bunny. She is not a dog's dog but is fine with them but doesn't like to be jumped on by the puppies. She can be out in the yard with all adults and is wonderful. She just likes to pretend she's a lap dog and will always choose a person over a dog. Major is one of 4 male pups who came up to us from a rural part of WV. They have never been in a shelter as the humane society who rescued them use foster homes. They are healthy and playful and ready for their new homes. If you are a family, please have a physical fence. If you are a working person, please have flexible hours and/or a dog walker. They are all crate trained and 99% house trained as they are used to going outside for potty. They all are very friendly and affectionate and all still have puppy breath. They love the water! Come meet him at our Meet and Greet on Saturday at Especially for Pets in Wayland from 2-4. Come meet him at our Meet and Greet on Saturday at Especially for Pets in Wayland from 2-4. 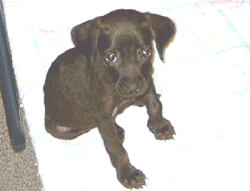 Margie is an 11 week old puppy who was taken from a mentally ill man who had her in a rabbit cage when she was 8 weeks old. Her initial pictures were so sad. The vet says she looks healthy, except for her bow legs, probably from lack of nutrition. Her coat is not the best. She is in a foster home in WV and is doing great and eating well. They've done a great job fattening her up. She will need some TLC as there could be some abuse and certainly there was neglect, so an adult home is required. She appears to be a spaniel mix of some sort, but we'll know more as we evaluate her. Look at her before and after pictures below. The first is her before and the others are after she put some weight on. She is up to 11 lbs now. 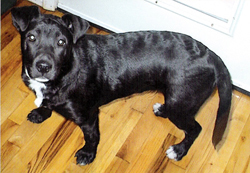 Onyx is a six month old female Lab mix who has the look of a Lab/Dane mix but without the size. She's actually even small for a lab. She is a friendly pup who was recently adopted to a family with a pug and she was too much for the pug so if there are other dogs, they should be similar in size or larger. She has some white on her chest and feet so some will say she has Pit in her but I don't see any of the bully breed features, but if you're Pit-phobic, she's not the dog for you. She's going to be an easy keeper for whomever adopts her, no bad habits, clean in her crate, good on leash, just a great dog! 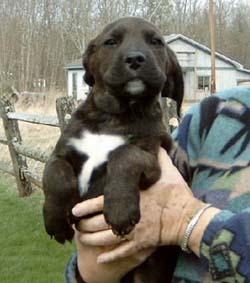 Riley is one of 4 male pups who came up to us from a rural part of WV. 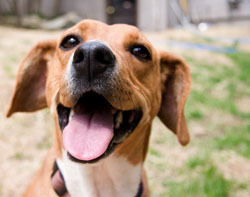 They have never been in a shelter as the humane society who rescued them use foster homes. They are healthy and playful and ready for their new homes. If you are a family, please have a physical fence. If you are a working person, please have flexible hours and/or a dog walker. They are all crate trained and 99% house trained as they are used to going outside for potty. They all are very friendly and affectionate and all still have puppy breath. They love the water! 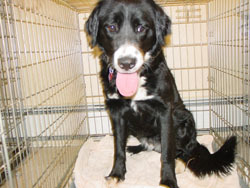 Shadow is a spayed female border collie, around 12 months, who is great with dogs and children. She is a people dog, so prefers being with people over just being a friend for your dog. She is great on leash and very affectionate, and will be available to meet after the 2nd. Please apply so we can arrange an introduction. 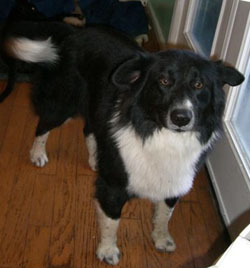 This beautiful Border Collie male was dropped off with his friend, Pincher, the collie/shep mix. Both are great buddies so he's good with other dogs. Now that we have him here, he looks mature, about 2 or 3. 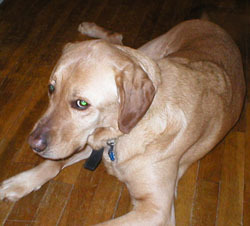 He was fostered with children in a dog-savvy home. He's good on leash and very affectionate. He is available on the 2nd. You can change his name as they just named him. We do not recommend putting Border Collies on electric fence. Come meet him at our Meet and Greet on Saturday at Especially for Pets in Wayland from 2-4. 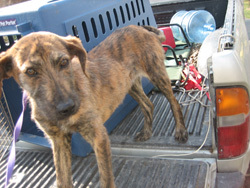 Taylor is one of 4 male pups who came up to us from a rural part of WV. They have never been in a shelter as the humane society who rescued them use foster homes. They are healthy and playful and ready for their new homes. If you are a family, please have a physical fence. If you are a working person, please have flexible hours and/or a dog walker. They are all crate trained and 99% house trained as they are used to going outside for potty. They all are very friendly and affectionate and all still have puppy breath. They love the water! Come meet him at our Meet and Greet on Saturday at Especially for Pets in Wayland from 2-4. Toffee is six years old with the energy of a two year old. He is house trained and knows basic commands (sit, stay, lay down). He is great with kids, both young and older. His owners thought he would be a forever adoption, but changed jobs and no longer have time for him. They have a 3 year old that he tolerates very well and a group of neighborhood kids from about 5 to 11 years old that he plays with and there has never been a problem or complaint. Playing fetch with a tennis ball is his favorite thing to do. He loves to be around people all the time and enjoys the outside, but is definitely an "indoor" dog. This guy is so funny and cute. He looks like a giant terrier or a possible wolf hound mix. 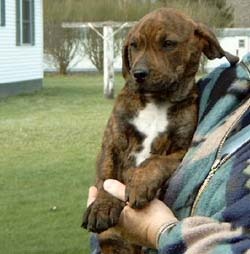 He has a brindled coat so might be also mixed with plott hound. The vet put him at 5 months as he still has some baby teeth. He is very friendly and skinny. Love those whiskers! He had been hanging around at a back road with another dog. We're calling him Dale for he was found on Lillydale Road, in a rural town in WV. He is very crate trained and will house train easily.